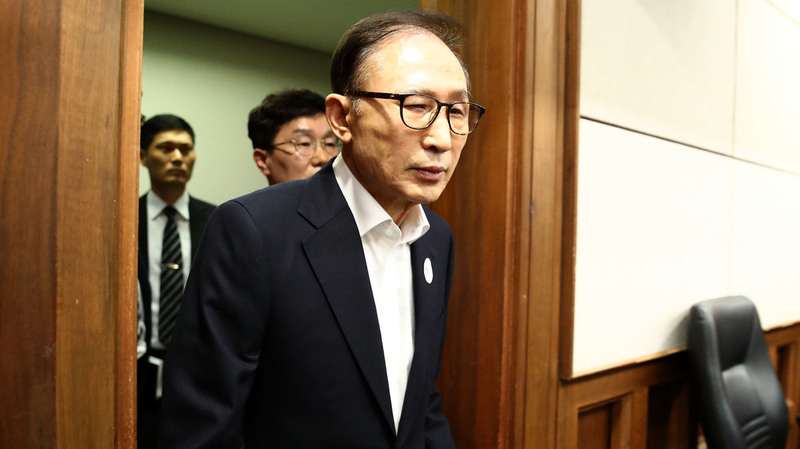 Former South Korean President Sentenced To 15 Years In Prison On Corruption Charges Lee Myung-bak, who served as president from 2008 until 2013, had been convicted of embezzlement and of taking $5.4 million in bribes from Samsung. Lee Myung-bak was sentenced Friday to 15 years in prison. He had been convicted of embezzlement and taking $5.4 million in bribes from Samsung. South Korea's former president, Lee Myung-bak, was sentenced Friday to 15 years in prison for bribery and embezzlement. He will also have to pay $11.5 million in fines. Lee is the second South Korean leader convicted this year of charges of corruption and the fourth former president to be arrested for corruption since the 1990s. Prior to entering politics, Lee had been an executive at Hyundai and campaigned on a promise to help South Korea's economy grow. Lee served as president of South Korea from 2008 until 2013. A court ruled Friday that before and during his presidency Lee accepted $5.4 million in bribes from Samsung, South Korea's largest conglomerate. In exchange, Lee had granted a presidential pardon to Lee Kun-hee, Samsung's chairman, who had been convicted of embezzlement and tax evasion. The conviction had forced Lee Kun-hee to resign from Samsung in 2008; he returned to work at the company shortly after receiving the presidential pardon. The court also found that former president Lee disguised his ownership of a lucrative auto-parts maker under the names of his relatives and embezzled 24 billion Korean won from the company, according to The New York Times. Samsung later offered to pay legal fees for a court case involving the auto-parts company. Lee did not appear in court on Friday, and he has previously denied the charges. "During the hearings, he shifted the blame to his aides, accusing them of committing the crimes for their own profit and conspiring against him," Judge Chung Kae-seon said on Friday, according to The Times. South Korea became a democracy in the 1980s, but corruption continues to taint elected leaders' ties to business leaders. In 2013, Lee was succeeded as president of South Korea by Park Geun-hye, who was impeached and ousted on charges of corruption and abuse of power. Park was later sentenced to 25 years in prison for those crimes. In February, an appeals court convicted the son of Samsung Chairman Lee Kun-hee of bribing Park. Two other former South Korean presidents, Chun Doo-hwan and Roh Tae-woo, were convicted of corruption and separate offenses in 1997; they were both later pardoned. South Korea's current president, Moon Jae-in, has promised to root out corruption in the government. He won an election to replace Park in May of last year.